North America Gasoline Genset Market size was valued over USD 1.3 billion in 2017 and annual shipments is anticipated to exceed 2 Million Units by 2024. 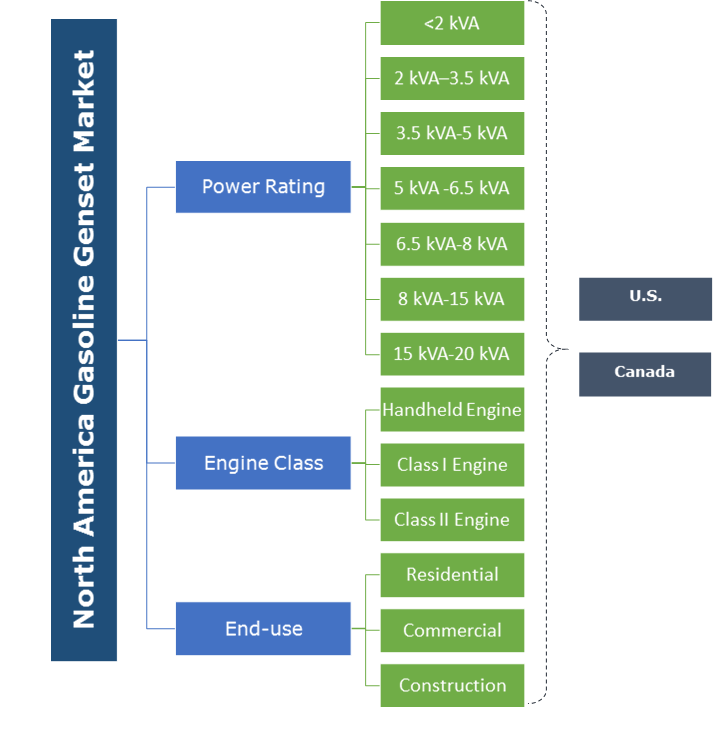 Inadequate power supply along with accelerated demand for continuous and reliable power will positively impact the North America gasoline genset market growth. Increasing frequency and intensity of weather-related calamities resulting in chronic outages will further accelerate the product deployment. The Hurricane Irma of September 2017, a Category 5 hurricane cut power to nearly two-thirds of Florida's electricity customers causing over 64% of all electricity customers in the state without power. Growing significance of emergency preparedness amongst the consumers will further complement the industry outlook. Aging grid infrastructure coupled with deteriorating grid resiliency will stimulate the North America gasoline genset market size. The American Society of Civil Engineers (ASCE), in 2017 assigned a grade of D+ to the country’s energy infrastructure, citing an aging electrical grid, resulting in an increasing number of power disruptions. Rising expenditure toward backup power solutions accompanied by growing consumer awareness will favor the industry growth. Growing consumer preference toward units with smaller surface footprint, and easier portability will sustain the dominance of smaller power rated gensets, predominantly the 3.5-5 kVA range. These ability of these gensets to adequately cater to consumer power requirements, predominantly across residential establishments will favor their incursion in the industry. Light weight, operational suitability, and compactness are the other features encouraging the use of these units. Growing demand for dependable and consistent power across job sites will boost the 8-15 kVA gasoline genset market size. These gensets are predominantly deployed across the construction sites and industrial spaces to adequately and efficiently power construction tools & equipment. Minimal operational costs and ease of movement of these units will further strengthen their adoption. Class I engines gasoline genset market is set to grow on account growing consumer interest toward purchasing smaller and lower power rated units, predominantly suitable for residential establishments. Affordable fuel prices, relatively safer operation and favorable capital structure will encourage the product deployment. However, rising R&D investments to conform with the emissions standard criteria will enhnace the overall manufacturing costs of these units. Progressing technological advancements coupled with growing stringency of regulatory compliances will stimulate the Class II engines gasoline genset market size. Recent innovations including the introduction of twin cylinder technology which ensures minimized safety risks will significantly strengthen the industry outlook. Residential gasoline gensets are primarily deployed for backup power in homes, buildings, residential flats, villa, cottage, or bungalows to provide power continuity during brownouts, weather-related outages or other power fluctuations. Affordable price portfolio, small surface footprint and quick response time to a grid failure are the key defining parameters strengthening the product demand. The construction applications, in 2017 accounted for over 15% of the North America gasoline genset market share. The growth across the sector is attributed to robust construction activities driven by increasing infrastructure spending across the region. The indispensable need to power construction equipment at jobsites or remote areas will necessitate the deployment of these units. Robust construction activities driven by an elevated construction spending in the region have been triggering demand for gensets as an indispensable power supply source. Substantial investments in backup power systems to circumvent the excessive costs associated with power interruptions will fuel the commercial gasoline genset market growth. Growing deployment of backup power solutions for outdoor recreational activities will further stimulate the product demand. 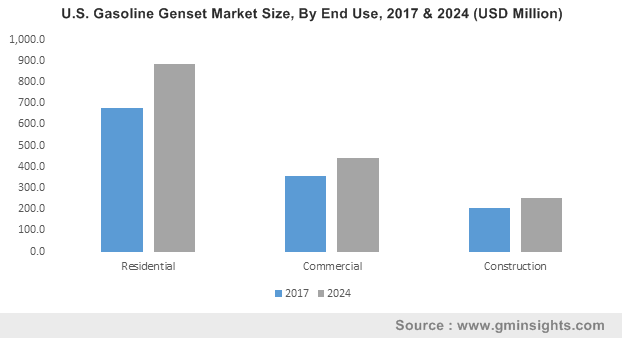 The U.S. gasoline genset market is predicted to grow over 4% by 2024. The industry is dynamically driven by the aging and increasing vulnerability of the grid infrastructure along with intensifying and frequent weather-related disasters. The inability of the electrical grids to sustain an amplified demand load along with recent occurrences of severe hurricane events, notably the Hurricane Irma and Hurricane Harvey, has contributed to a significant industry expansion in the country. Increasing intensity of winter storms that lead to massive power outages will drive the Canada gasoline genset market size. According to BC Hydro, a Canadian electric utility, extreme weather events have tripled over the past five years, leading to an upsurge in damaged electrical infrastructure and power outages. Subsequently, growing significance of emergency preparedness amongst the consumers will pave the way for the prevalent deployment of these gensets. Notable players operating across the North America gasoline genset market include Cummins, Kirloskar, Briggs & Stratton, Kohler Power, Generac, Honda Motor, Caterpillar, Atlas Copco, Honeywell, Wacker Neuson, John Deere amongst others. Major stakeholders in the industry are consistently pursuing mergers & acquisitions to attain economies of scale, product differentiation, and increased financial strength. Gasoline gensets are predominantly deployed for portable use or intermittent backup power applications and are also commonly known as portable gensets. These products essentially serve as an emergency home backup power source and are also deployed for recreational and construction purposes. Affordable power, easy operation, easier fuel availability and high portability are some of the underlying features that will stimulate the adoption of gasoline fueled gensets.